Derek Eller Gallery is pleased to announce Lily of the Arc Lights, Ellen Lesperance’s first solo exhibition in New York City. In this show, Lesperance continues her ongoing project of translating articles of clothing worn by protestors at the Greenham Common Women's Peace Camp into compositions that are inspired by Symbolcraft, a universal for of knitting instruction. A series of new gouaches paintings on paper will be accompanied by a garment knitted by the artist. The Greenham Common functioned as both a military facility and a public park in Berkshire, England until 1979 when NATO called for it to be converted into a United States Air Force base. In the wake of the Cold War, the base came to house the largest stockpile of nuclear Cruise missiles in Europe. In September 1981, a group of Welsh protestors calling themselves "Women for Life on Earth" marched for seven days from Cardiff, Wales to the base, intent on delivering a letter expressing their opposition to nuclear proliferation to then-Secretary of Defense, Francis Pym. The Secretary dismissed the request for a meeting, sarcastically inviting them to stay as long as they'd like. This marked the beginning of a protest composed of nine camps inhabited exclusively by women surrounding the base that lasted nearly twenty years and included, at times, thousands of participants. Acts of protest at the camp were always creative and visually dynamic, similar to an artistic practice. Over many years, the perimeter fence of the base was elaborately decorated with fabric, sentimental objects, and darning in what one camper described as "a womyn's collage of life". In December 1982, thirty-thousand women joined hands surrounding the perimeter in a protest called "Embrace the Base" which was their largest and most publicized action. Another time, hundreds of women entered the base dressed as snakes. These acts consistently drew upon the protestor's identities as mothers, highlighting their desire to protect future generations of children from the threat of nuclear weapons. The campers understood from the start the strength these acts had as images and that when reproduced and broadcast, these new and arresting images would effectively bring attention to their cause. Lesperance's interest in this movement stems from its feminist nature as well as its continued relevance as a model for creative and civil protest. In seeking primary sources, she searched libraries throughout the United Kingdom as well as the archives and personal photographs of women who were active in the camps. 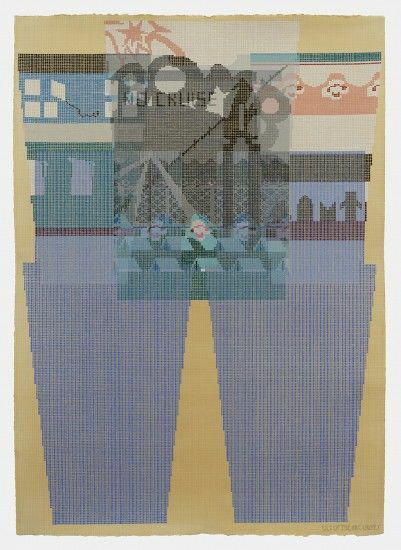 By utilizing Symbolcraft, Lesperance effectively tells the story of women from the peace camp with a visual language not beholden to the patriarchal coding of Western art. By depicting these garments she also elevates the tradition of textile arts preserving many pieces that would otherwise be lost to history. With each meticulously rendered painting, there are moments of improvisation, slight deviations from the exact garment, allowing each piece to function as a portrait of the wearer rather than simply a historical documentation of clothing. In this newest body of work, images of mountain ranges, rock striations, rainbows and winding paths emerge from pixel-like grids of color, fusing figuration and landscape together into densely stippled patterns. Ellen Lesperance lives and works in Portland, Oregon. Her work was recently included in Trigger: Gender as a Tool and a Weapon at the New Museum, New York, NY. Her work has also been exhibited at Drawing Center, New York, NY; Seattle Art Museum, WA; Ashland Art Museum, OR; Portland Institute of Contemporary Art, OR; the Dahl Arts Center, Rapid City, SD; Southeastern Center for Contemporary Art, Winston Salem, NC; Scottsdale Museum of Contemporary Art, AZ; and the Cantor Fitzgerald Gallery, Haverford, PA. Her work is included in the collections of the Elizabeth A. Sackler Center for Feminist Art, Brooklyn Museum, New York; The Museum of Art and Design, New York; Portland Art Museum, OR; Schneider Museum of Art, Ashland, OR; the Bill and Melinda Gates Foundation, Seattle, WA; and the Kadist Art Foundation, San Francisco, CA. Her work will also be on view at Bonniers Konsthall, Stockholm and Tate St. Ives in the fall of 2018. The artist has received grants and awards from the Tiffany Foundation, Robert Rauschenberg Foundation, Art Matters, Pollock Krasner Foundation and the Ford Family Foundation.